Save Up To 95% On Your Prescription Medications Today! IF you have a high deductible plan, expensive copay, or currently uninsured US Rx Savings can help! The US Rx Savings Card is helping people all across America save money on their prescriptions and it's absolutely FREE! 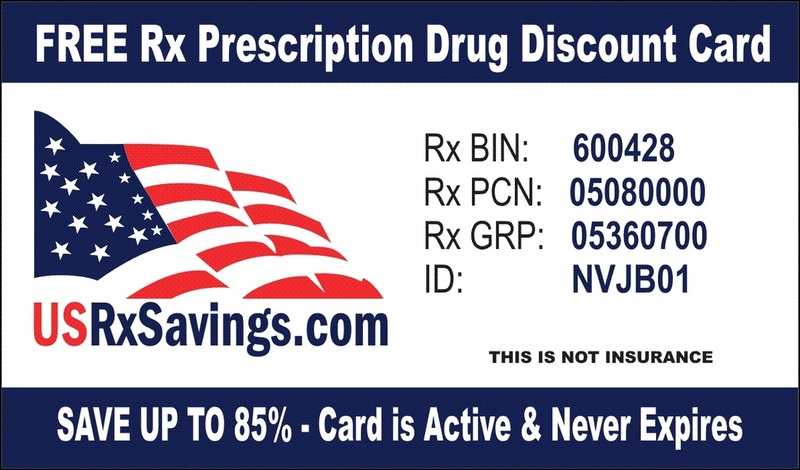 Simply download your FREE US Rx Savings prescription drug card and receive savings of up to 95% , sometimes more, at over 63,000 national, regional and local independent pharmacies across America. The US Rx Savings Card is HIPAA Compliant and we have the highest overall savings of any other card in the market. So, there is no need to shop around, with our card you will receive the guaranteed lowest price available on your prescription medications. 60 Million Uninsured People in America. 90 Million People in America without prescription drug benefits. Millions paying high copay with their current Insurance Plan. Millions of Underinsured & Your Insurance Plan does not cover your prescription(s). Millions of Seniors in the "Donut Hole" phase of your Medicare Part D Plan, Paying out of pocket for your medications. We Guarantee You ALWAYS get the lowest Price! By using the US Rx Savings card you are guaranteed to always get the lowest (or best) price available at a pharmacy. The majority of the time the US Rx Savings Card is used your price will be significantly lower than any retail or sale price you would receive without the card. If a generic or brand name drug is available through a participating pharmacy at a lower price than the US Rx Savings card discounted price, you will pay only the lower of the two prices. To receive the deep discounted prices you are responsible for the entire payment of the prescription medicine purchased after any discounts are applied. * It's FREE - NO Cost - NO Catch! * No Lifetime Limits - Unlimited Use!